Eric Zimmer joins me on this episode of the podcast. He is a serial entrepreneur, coach, and host of the podcast, The One You Feed. Eric is endlessly inspired by the quest for a greater understanding of how our minds work and how to intentionally create the lives we want to live. At the age of 24, Eric was homeless, addicted to heroin, and facing long jail sentences. In the years since, he has found a way how to recover from addiction, and build a life worth living. 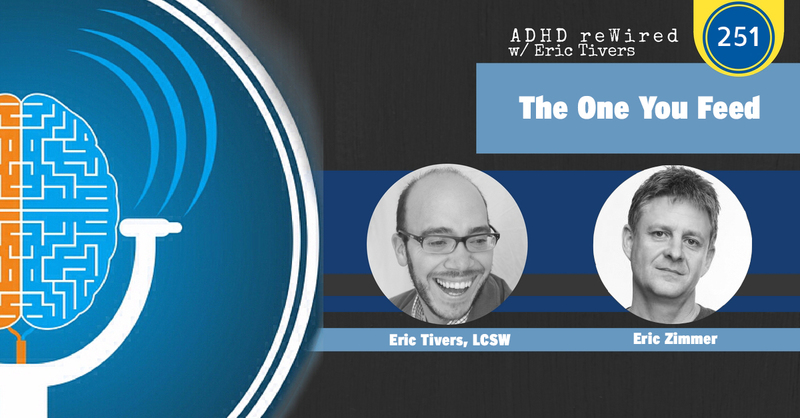 While Eric doesn’t know if he has ADHD, he does know a lot about doing hard things in order to live the life you want to live. In this conversation, you will hear Eric, and I talk about perfectionism, battling depression, and meditation and other forms of self-care. We also discuss the balance of being content and striving for growth. We even get a little “woo woo” in this conversation! [02:37] – Eric explains where he got the name of his podcast, The One You Feed. [05:05] – Half a lifetime ago, Eric was homeless. He tells us his path to that point in life. [10:40] – We talk about recovering from failure. [13:19] – Eric shares his thoughts on perfectionism. [18:51] – Eric says you need to throw the kitchen sink at depression. He shares what is in his kitchen sink. [26:29] – Eric talks about trying to balance being content and striving for growth. [32:17] – Eric describes why he feels that he is a spiritual person. [39:23] – I share my recent experiences with meditation and journaling. [45:18] – Eric describes his meditations, and says to try things and see what works for you. [48:43] – Eric talks about open meditation. [51:48] – Self-care is exhausting, but trying harder is even more exhausting. [54:19] – Eric states that we aren’t built well for long-term rewards. We share tips for people who are not in an exercise routine. [1:00:30] – Eric explains how we figure out how to unlock the key to our mental health. [1:05:22] – Eric says that learning life lessons like a spiral staircase. [1:07:46] – The more we do hard things, the easier it is to do hard things.